I have found, just as many of you probably have as well, that being a woman in her twenties isn’t as easy as it looked when you were a teen. There’s so much more stressful situations that I face that I had no clue about and probably the best advice you can get is from someone’s who’s already been there. That’s why I loved “Stress Point: Thriving through your 20’s in a Decade of Drama.” The book is written by Sarah Francis Martin of She Seeks, the Proverbs 31 ministry geared towards 20-somethings like myself. 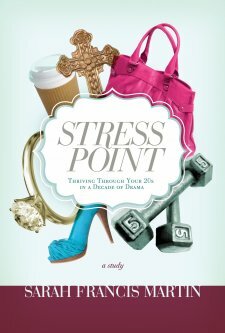 Stress Point is a study guide that covers the 10 most stressful subjects that face young women today such as career, money, self-image, love, and spiritual maturity. Each stress point is its own chapter with applicable scripture to back it up. Included in each chapter are 5 interactive journals, perfect for tackling one each day during the week. Martin includes real stories of her in those situations. The guide is easy to read and the format would be great to do in a ladies class at church and with girlfriends. Martin relates well to the reader and comes across genuinely.